Brilliant is gorgeous, full-color hardcover that walks the reader through ancient cultures showing how history affirms a literal 6000 year-old history of our planet. Page after page of this beautifully illustrated book shows how the ice age, ancient cavemen, sunken cities, prehistoric inventions, knowledge of the Garden of Eden (from outside of the Bible), dinosaur artifacts, and many more examples draw even a skeptical reader to the conclusion that the Bible provides a totally accurate record of Earth history. Every page prominently features a timeline to reinforce the reality of a truly Biblical view of history and show where key events and cultures from history fit into the Bible’s narrative. WE MUST GET INTERESTING, CREDIBLE, AND EASY-TO-READ BOOKS INTO THE HANDS OF OUR FAMILY, FRIENDS, AND NEIGHBORS WHICH SHOW THEM WHY THE BIBLE IS TRUSTWORTHY. 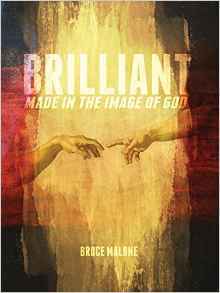 Just as Censored Science walks the reader through the major disciplines of science and shows how all of science confirms Biblical truth, Brilliant takes the reader through history to confirm Biblical truth. These books form an incredibly powerful “one-two” punch to push back the lies and deception engulfing our society. Sale Price=$12.50 - Retail price=$16.95, free pickup, flat rate shipping $3.00 in USA, WE PAY TAXES!